Broccoli sprouts contain cancer-fighting substances. Growing broccoli sprouts at home is an easy and inexpensive way to enjoy these nutrient-rich sprouts. 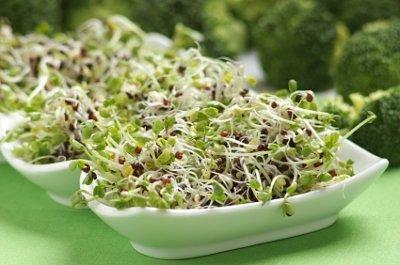 Broccoli sprouts pack a nutritional punch, full of cancer-fighting antioxidants, minerals, vitamins, and even protein. Broccoli sprouts are broccoli seeds that have just begun to mature and grow. If left unharvested, the sprouts would grow into full broccoli plants. Sprouting seeds are becoming popular because of their high levels of nutrients. It is common knowledge that broccoli is a healthy and nutritious food, full of vitamin C, vitamin K, folate, and more. The cancer-fighting element found in broccoli is called sulforaphane, and this phytochemical has led to broccoli being labeled a "super food." Broccoli sprouts are also a great source of plant estrogen, which can help women with the hormonal changes associated with PMS and menopause. Broccoli sprouts are available commercially at grocery stores, markets, and health food stores. Alternatively, you can save some money and keep a continuous supply of them on hand by growing sprouts at home. The containers needed for planting the broccoli seeds can be recycled items like plastic berry containers, or you can use baking pans, lined cardboard boxes, or anything that will hold a layer of soil and keep it moist. Soak the broccoli seeds overnight in room temperature water. Place a layer of soil in the container and add a bit of water to moisten. Scatter a thin layer of seeds on top of the soil. You don't need to worry about spacing the seeds out, since they won't be growing into full plants. Cover the seeds with a thin layer of potting soil. Place a layer of plastic wrap over the top of the container, and poke a few holes in the plastic to allow for gentle air circulation. Store in a warm, dry place, away from direct sunlight. Once your sprouts have been started they should start to sprout within two days. Three to five days after sprouting, they're ready to eat. Sprouting jars are often used as a miniature greenhouse for starting plant seeds. It is not recommended to use these jars for broccoli sprouts, since many of them don't allow the proper drainage or ventilation required. Sprouts can attract mold and other fungus if left in a damp environment for too long. When choosing the seeds for growing sprouts, make sure to check packet labels. Many commercial seeds are treated with chemicals and other substances to make them last longer. While these treatments are not harmful in a fully grown plant, they would be more concentrated in a sprout, which hasn't had nearly as much growing time. Look for organic broccoli seeds, without any pesticides or other chemicals. You will likely run into fancy hybrid and other designer seeds, but these are more expensive and completely unnecessary. Simple, untreated broccoli seeds are perfect. After harvesting, broccoli sprouts should be stored in a ventilated container in the refrigerator for up to two weeks. If your sprouts have a bad smell or feel slimy, throw them away. Broccoli sprouts may be frozen, but after thawing they will no longer be crunchy. The texture of defrosted sprouts can be off-putting. Cooking broccoli sprouts in water will greatly reduce their nutritional value. If they must be heated, consider warming them up, covered, in the microwave. Plant new seeds every few days in fresh containers to ensure an ongoing supply. Sprouts can be added to salads and sandwiches, or used as a topping for snacks like crackers with cream cheese. Broccoli sprouts are tasty and very nutritious, and they're fun to grow yourself. Try getting the kids involved in planting and harvesting, and they may just be interested in eating them, too!